It’s true that your roof represents 40% or more of your home or business’s curb appeal. That’s a big deal. At Hopewell Roofing & Restoration, we know first-hand how important the right roof replacement shingles are to both the appearance and functionality of your roofing system. High quality shingles beautify your home, but also deliver the protection you need for a strong, healthy roof. What’s the Importance of Roof Replacement Shingles? When it comes to the highest quality roof replacement shingles, form and function marry to both increase curb appeal and reinforce roof protection. Roofing experts consider shingle laying an art, but there is also a science to it. The right shingles products provide rugged durability, ventilation, and protection against water damage and algae growth to strengthen your home or business roofing system. Improve your home or business curb appeal as well as resale value with Timberline® American Harvest® Shingles from GAF. These shingles complement your home or business’s exterior color scheme and provide a modern architectural style. Timberline® American Harvest® color palettes feature subtle blends with contrasting colors to give your roof unique depth and beauty. Professional installers have long preferred the rugged, dependable performance a Timberline® roof offers. In fact, Timberline® Shingles with Advanced Protection® Technology are the #1-selling shingles in North America. Get a great value with beautiful but practically priced shingles that come with a Lifetime ltd. warranty. Experience a higher level of roof safety with these shingles that received a Class A fire rating from Underwriters Laboratories; this is the highest rating possible. These shingles feature Advanced Protection® Technology that reduces the use of natural resources without sacrificing protection. Dura Grip™ Adhesive seals each shingle tightly and reduces the risk of shingle blow-off. Our shingles can withstand winds up to 130 mph. Experience the peace of mind you need thanks to a Lifetime ltd. transferrable warranty with Smart Choice® Protection (non-prorated material and installation labor coverage) for the first ten years. Our team has more than a decade of roofing experience that has led us to choose GAF Timberline Shingles as our preferred brand. The products are second to none and feature the top warranties the roofing industry has to offer. As a family-owned business, we only use products we would use for our own family members’ homes and businesses. We believe these roof replacement shingles will give your home or business the curb appeal and protection you need to make the most of your investment. Furthermore, as a certified GAF Master Elite Contractor, we can install your roof to the exact specifications required in order to get you a 50-year Lifetime Warranty directly from GAF as well as a 25-year labor warranty. 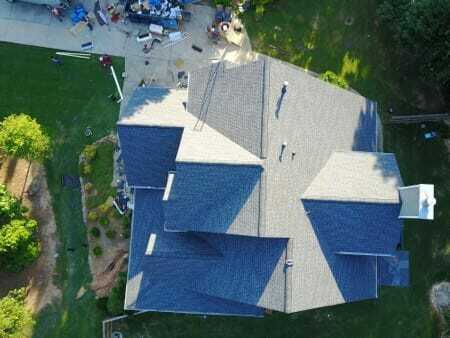 Contact our team today to learn more about the top quality shingles products we provide for our customers. Dimensional Look: Features GAF’s “High Definition” color blends and enhanced shadow effect for a genuine wood-shake look. Stays In Place: Dura Grip™ Adhesive seals each shingle tightly and reduces the risk of shingle blow-off. Shingles warranted to withstand winds up to 130 mph. Perfect Finishing Touch: Use Timbertex® Premium Ridge Cap Shingles (in the West, use Ridglass® Premium Ridge Cap Shingles). Custom-Designed Color Palette: Specially designed to complement your home’s exterior style. Subtle blends with contrasting colors that will increase your roof’s dimensionality.